Your perfect travel companion, now with Apple Pay. Earn Rewards^, pay easily and securely on the fly. 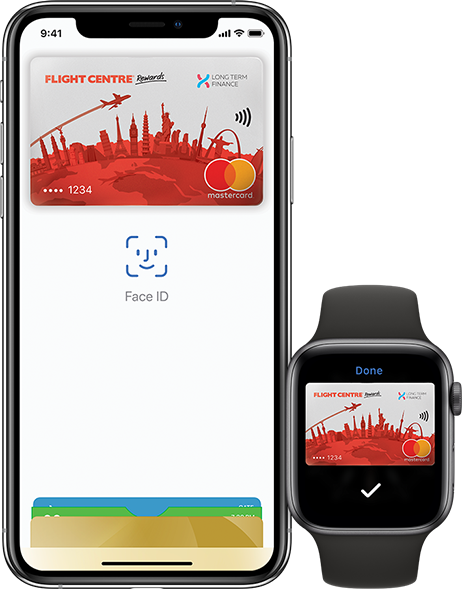 Pay safer and faster using your Flight Centre Mastercard® with Apple Pay. The secure way to pay with an Apple device*. 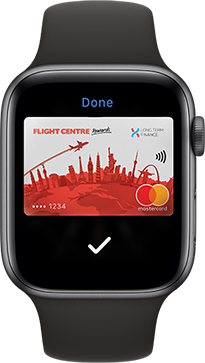 Enjoy all the benefits of Flight Centre Mastercard with Apple Pay on iPhone, Apple Watch, iPad and Mac*. Using Apple Pay is secure because your card information isn’t stored on your device or shared when you pay. Paying in stores, apps and online has never been easier, safer or more private. Tap the “+” sign in the upper-right corner. To add the credit or debit card affiliated with your iTunes account, enter its security code. Or tap “Add a different card” and use your iPhone camera to scan the card information. Tap “Wallet & Apple Pay”, then tap “Add Credit or Debit Card”. Where can I use Apple Pay. 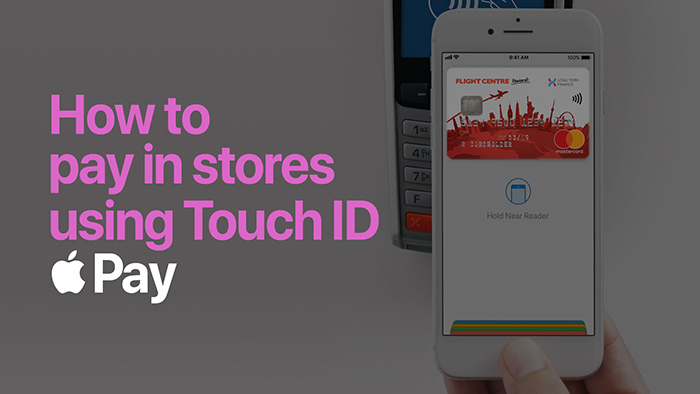 Apple Pay can be used anywhere you can Tap and Pay. Apple Pay is the safer, faster way to pay in stores with your iPhone and Apple Watch. Quickly check out using the devices* you carry every day. 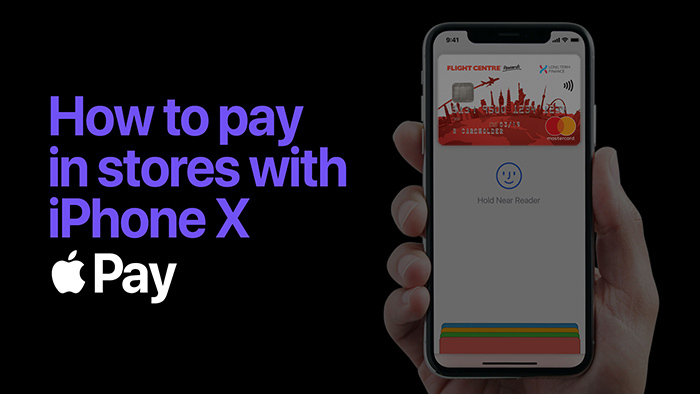 To pay with Face ID, double-click the side button, glance at your screen, then hold iPhone near the reader. For Touch ID, hold your iPhone near the reader with your finger on Touch ID. On Apple Watch, double-click the side button and hold Apple Watch up to the reader. Paying in apps and on websites. 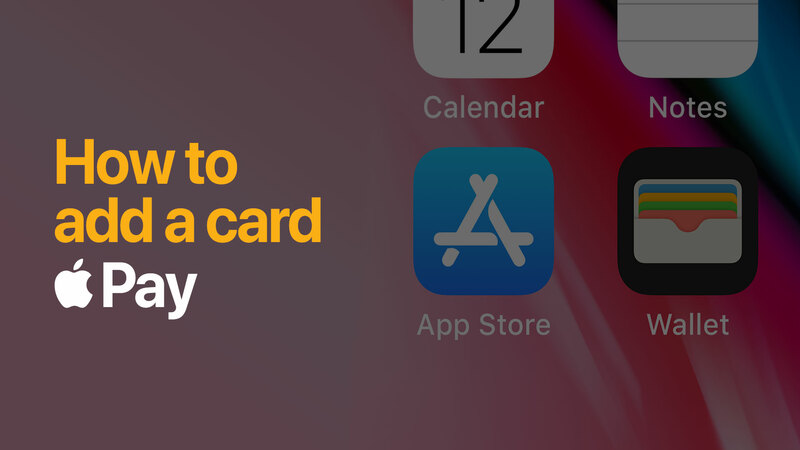 Apple Pay is the easier, faster way to pay in selected apps and on participating websites because you no longer have to create an account or fill out lengthy forms. To pay in selected apps and on participating websites in Safari on your iPhone and iPad, select Apple Pay at the check-out and complete the payment using Face ID or Touch ID. To pay on participating websites in Safari on your Mac, select Apple Pay and complete the payment using your iPhone or Apple Watch. On MacBook Pro, pay using Touch ID on the Touch Bar. 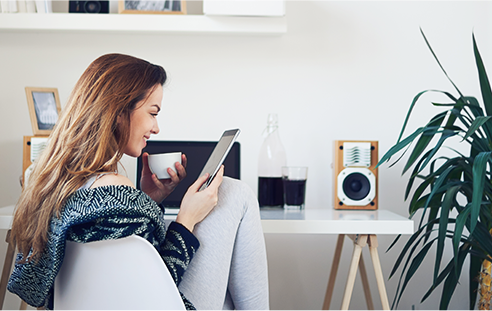 ^Earn 1.00 Flight Centre Reward for every NZ$100 spend on standard purchases (excludes cash advances, balance transfers, fees, interest charges or quasi-cash transactions). Earn 2.00 Flight Centre Rewards for every NZ$100 spent in-store or online at a New Zealand Flight Centre store, Student Flights, Cruiseabout or Travel Associates store. 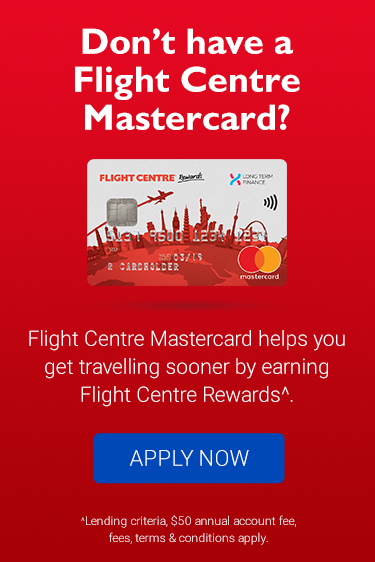 When redeemed, every 1.00 Flight Centre Reward earned will equate to NZ$1.00 credit towards your Flight Centre Mastercard account.